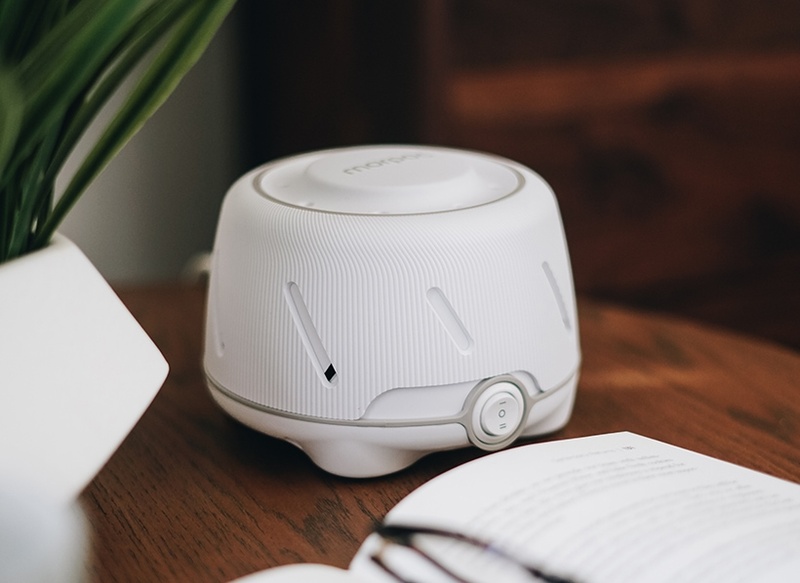 When we partnered with Marpac in 2016 to redesign their flagship product, Dohm, we were looking at a device that already had a rich history and huge consumer following. The first model was made in 1962, and since then it has fundamentally remained the same. People everywhere LOVE their Dohms because the soothing sound of moving air helps them sleep, period. If you go to Amazon.com right now, you can see that the original model has almost eleven thousand reviews and consistently maintains over a four-star rating. If you ask me, this is no small feat. I find those who take the time to write product reviews on the internet generally fall into two camps: one group being the brutally critical, outspoken skeptics of the world, and the other consisting of consumers who simply cannot contain themselves when they purchase a product that makes them happy, the latter usually making up the minority. So, taking into account just how many reviews it has and the fact that the majority of those reviews are so positive, I consider the Dohm nothing short of impressive. In tackling the redesign of this product, we knew we were starting with something very special. The Dohm Elite design from 1988 (left) and the 2018 redesign from Michael Graves Architecture & Design (right). With this legacy in mind, we were ready to bring something new and exciting and modern to the table. The feedback that Marpac continued to get on the original Dohm was that customers loved how it worked but didn’t love how it looked, and this was the impetus for an aesthetic upgrade. Immediately we started thinking about the fun forms that we could explore and how we could use a different shape to really push the design forward. However, we hit a constraint early on that was somewhat unusual: the physical shape of the Dohm is what allows it to have that characteristic sound. The pitch and tone that the machine produces are completely contingent on how the fan inside deflects air off the walls of the housing. We learned in talking to the engineers that even adjusting the diameter or making alterations to its height would cause significant changes to the sound it made, which was not going to be acceptable. We absolutely could not take away the thing customers love most about this product. The common misconception would be that this realization squashed our creative energy as we began our process. To the contrary, the designers here at MGA&D thrive on tough constraints because we feel it helps us focus our creativity and push us towards even greater solutions. I’m a firm believer that imagination should have no boundaries, but imagination is not the same thing as design. Without some well-considered parameters in place at the beginning, blue sky designing can become chaotic and ideas difficult to organize. It means the possibilities are in fact endless, which can lead to a sense of overwhelm and make decision making tedious. Having stipulations as to what we can do provides a level of concentration to our creativity, and ultimately allows us to execute effectively and efficiently. With a general form already in place, we wanted to deeply evaluate the user experience of the machine to make as many improvements as possible. In talking with several users, we found out that the top portion of the product that twists to adjust tone was rarely used because many people weren’t even aware that it moved! By creating a subtle, knob-like protrusion at the top we were able to visually call out the moving piece, and the indent just below provides a place to rest your fingertips and grip easily. On the original Dohm, in order to adjust the primary tone control you had to grip around the main body of the machine, which could be difficult for smaller hands. We moved the part break further up on the new design, so it could be gripped at its narrowest point, also putting the two controls closer together. In doing so, all the points of contact are in one place and simple to manipulate, making dialing in your ideal sound for sleeping as easy as counting sheep. Dohm Elite settings are adjusted from the top dial and the low/off/high button in front. Once we nailed down the more functional details of the new Dohm, we started to hone in on the aesthetic elements that would make it feel unique. The challenge was to differentiate and modernize the look on a smaller scale, so we started with adding a textural element that is not only beautiful but references the physical fan inside. There is a little bit of magic in how the sound emitted from Dohm is made. Other white noise machines that produce digital or electronic audio inherently have a loop in their sounds, which we learned your subconscious can perceive even during sleep. Since the Dohm makes its sound using a mechanical fan, there is never an interruption. This aspect of the product is something we felt should be celebrated. We designed the flowing micro-ribs to swirl from the top and spill down the side of the body in response to the movement of air created by the fan. As an added benefit, the texture provides even more finger grip when adjusting tone. We also designed in part breaks that provide an opportunity for subtle color variations and act decoratively as piping does on soft goods. The thin stripe on top separates the two moving pieces, and the one toward the base creates a grounding datum that wraps around the power switch and presents it like a jewel. Lastly, we wanted to inject a level of character that would be befitting of the Marpac brand, which celebrates sleep with a ton of positivity and charm. This lead us to developing the four little “feet” that the whole unit rests upon, which work not only to provide iconic personality, but add physical stability to the product. In establishing all the different elements that defined the new Dohm, we had begun to create a design language for the Marpac brand of products that could be expanded upon as we developed a full collection. The next project we tackled was an upgraded sound conditioner that still relied on the physical fan but had a few more features and benefits. This new unit would have variable speed control providing a larger range of customization, and it would also be app enabled and Alexa voice controlled to allow users not only to operate it remotely, but also to set schedules and manage multiple devices. And so, the Dohm Connect came to be. It maintains many of the signature design elements such as the swirling ribs and decorative stripes, but with subtle variations. The texture is scaled to appear more fabric-like, and metallic accents create a more premium feel and speak to the addition of technology. With the need for additional buttons to control the variable speed of the fan, we relocated the power button to the top, framed by the increase and decrease functions keeping the entire interface centrally positioned and easily accessible. From there we went on to design an electronic unit, the Whish, which introduced a much more involved user interface with the multitude of sounds it produces each needing its own button to activate. In this instance, without the inclusion of a physical fan, we were able to shrink down the size for portability – the added cuteness factor was just a bonus – and we chose to keep the body smooth and sleek, instead focusing on the speaker grill pattern for our element of texture. When you start the design process, it is inevitable that challenges will present themselves at various stages. In this case, we started with a particular challenge that wasn’t meant to be overcome, but rather to be celebrated and used as a tool to target our capabilities. The result is a product line that is not only aesthetically befitting of the brand, but shows an effortless cohesion that presented itself naturally through our design process. As a company, Marpac’s goal is to present its customers with all the tools necessary to get the best night’s sleep. They have conquered sound, and as they move to expand their product line into other categories, we are thrilled to be along for the journey with them, knowing together we have successfully laid the design groundwork based on focused creativity. Check out the Marpac products in person at the Sleep-in@Nordstrom Pop-in Shop, online and in select stores until August 26th. MGA&D is recognized as one of the leading design practices in the world. We provide product design, graphic design & branding services, design research and design strategy consulting, as well as architecture, master planning, feasibility studies and interior design. Marpac is all for sleep. We are for drooling on the pillow and waking up in the same position. We are for being out like a light, and for sleeping like a log. We believe nighttime is the right time, that naps rule, and good bedhead is a badge of honor. But above all, we believe sleep should never be a struggle, because it’s way too important (and way too good) to miss out on. Most of our products are made (Yogabed) or assembled (Dohm Classic and Dohm) in the USA — some by teammates who have been with our company for so long their ears are part of quality control. In fact, they sign each and every sound machine… you guessed it – with love. That’s why Marpac products last for decades. So you’ll get a serious night’s sleep every time you use one.